Around the wider world of golf: Happy 4th of July, everybody! We have a celebrant who hasn't been to the winner's circle in a while -- Frenchman Thomas Levet won the Alstom Open de France on the ET. Celebrating her very first win is Tiffany Joh, who won the rain-shortened South Shore Championship on the LPGA's Futures Tour. (UPDATE: The Constructivist let me know this is actually T-Joh's 2nd win.) And we've also got some repeat offenders -- Ayako Uehara won the Nichi-Iko Ladies Open on the JLPGA (her 3rd victory, about which the Constructivist has details), Caroline Hedwall won the LET's Finnair Masters (her 2nd this year), and John Cook won the Montreal Championship on the Champions Tour (which I believe is his zillioneth win, or something like that). Well, for a while it looked like the story at Tiger's tournament might be "Choi Story 2," but in the end it was "What knee? Watney!" Although the continued uncertainty about Tiger's knee dominated the tournament early in the week, Saturday's scoring barrage and Nick Watney's course record 62 (breaking Chris Kirk's record 63 set earlier in the day) stole the show. And when Watney finished the third round in a tie with Rickie Fowler... well, Sunday had all the makings of a Young Guns shootout. But Rickie stumbled right out of the gate with a double bogey on the second hole and never contended. Watney was ready, however; a birdie on the same hole launched the chase. Several players made runs at him, but Watney never gave up a shot, forcing those players to press their hands. Although there were a few low scores to be had -- Chris DiMarco posted a -6 -- Aronimink was set up to play much harder on Sunday. By the 14th tee, Watney had only two real challengers left -- Jeff Overton and K.J. Choi. The 14th hole started Overton's downfall; three bogeys and a birdie left him in a tie for third place. K.J. was another matter entirely. 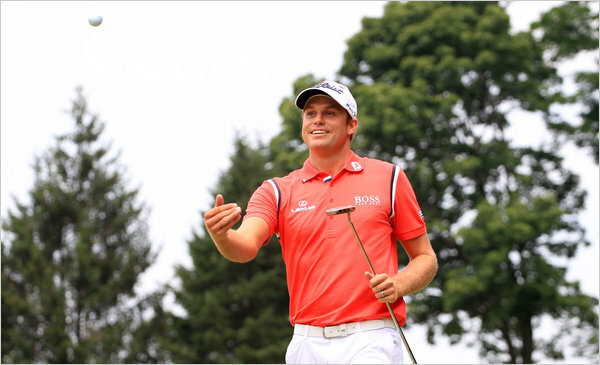 After a dicey start, Choi birdied the 14th and stepped onto the 15th tee tied with Watney. But a poor bunker shot and a chunked chip resulted in a double on the 15th, and Choi didn't have enough holes left to make up the two-stroke deficit. It didn't help that Watney could do no wrong. His Saturday back 9 (27) and Sunday front 9 (32) totaled 59 for 18 holes. He put nearly 70% of his 320-yard drives in the fairway, and one of the ones that missed got the "spectator draw" and bounced onto the short grass. His GIR was nearly 71%, he was #2 in Putts per Round (27.8) and #3 in Putts per GIR. He one-putted a lot of greens. And he made only 9 bogeys all week! That's what you call "fireworks." This was Watney's second win of the year. With a WGC (Doral) under his belt, this prestigious win will jump Watney up to about #6 in my Ruthless Golf World Rankings (I'm certain Nick was on pins and needles wondering about that) and probably cause many to see him as a favorite at the Open in two weeks. Among the rest of the Top 5, Charles Howell III managed to qualify for the Open because of his T3 finish and Adam Scott's T3 continues his improvement this year. Assuming Steve Williams will still be on Adam's bag at Royal St. Georges, that pair might be worth watching. And Aronimink fell to Nick Watney. No one knew what to say! And he holed putts with blinding monot'ny. The pic came from the New York Times web site. Click here to read their story.